Chris Wilder has no doubt Cobblers chairman Kelvin Thomas will make the right decision on his replacement at Sixfields, and says the new Town manager will get to work with ‘a fantastic, unbelievable group of players’. 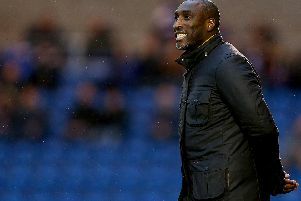 Wilder quit Northampton last week to take the top job at his boyhood club Sheffield United, and Thomas has been working round the clock to find his successor. Having worked with Thomas at both Oxford United and the Cobblers, Wilder has reassured Town fans the decision to pick their next manager is in good hands, especially as he is expecting ‘a lot of quality candidates’ to apply. “I am sure Northampton will make the right appointment,” said Wilder. “I am sure they will have a lot of quality candidates, and Kelvin will pick the right one. “I have worked with Kelvin through both of my most successful periods. “In my period at Oxford, he employed me and we worked well together, and I am sure he will get the right character, and the right man to work with him. The Cobblers are recruiting their new manager from a position of strength, having just ran away with the Sky Bet League Two title, winning it by 13 points, and will start next season defending a 24-match unbeaten run in the league. The squad is strong and confident, and although Wilder has admitted he isn’t ruling out the possibility of trying to sign one or two of his former players to join him at Sheffield United, even if he is successful in doing that, he believes Northampton are well set for the future, both on and off the pitch. “Northampton has a fantastic, unbelievable group of players,” said Wilder, who was joined in his switch to Bramall Lane by assistant Alan Knill and head of sports science Matt Prestridge. “The staff at the club showed exactly what they are all about when they continued to work for the club despite not getting paid for three months. “I have made a lot of fantastic people at Northampton that I imagine will stay in contact with for a very long time and I genuinely wish them all the best. Wilder may have only been the ex-Cobblers manager for a matter of days, but he says he’s already looking forward to finding out the date he will be able to return to Sixfields next season, and he admits it will be ‘a special day’ for him. “When I come back it will be a special day, but I will come to win. I think everybody knows what I am about,” said Wilder, who has been charged with getting the Blades promoted into the Championship. “As soon as the fixtures come out I will be drawing a big circle around the one at Northampton, and I will look forward to going back and seeing a few people that I have got to know really well.